While the industry gathers from near and far in Austin, Texas for SXSW, we use this time to realize how many great bands and new tunes are constantly being released and discovered. From great big acts to the garage band next door, you never know what you might find. This week we’ve got a wide range of rockers that capture the many ways you can use vocals and instruments to evoke entirely different experience. From funky pop brit-rock, to face-melting metal, experience new music, all Out Today. 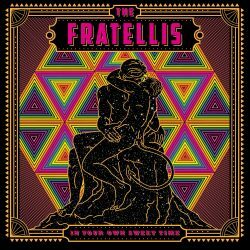 The Fratellis are at it again, with their brand new album In Your Own Sweet Time. With a one-of-a-kind sound and style, the Brit-rock group adds some 1970s pop flair to their fifth album. Redbrick agrees is “… the perfect balance between pop and rock and has a catchy chorus that will have the audience singing and dancing along.” With a fun and energetic essence, The Fratellis are a joy to witness live and are about to hit the road, touring through North America. Get a snippet of the Cooking Vinyl release, with their video below for “Starcrossed Losers” and jam out to the full album here. Are you craving heavy breakdowns, intense double-bass and powerful vocals? Look no further, because Rivers of Nihil will quench your head banging thirsts. Their new album Where Owls Know My Name is out now via heavy metal connoisseurs Metal Blade Records. Guitarist Brody Uttley described their title track to Loudwire stating, “This song in many ways feels like the perfect culmination of everything that we were, everything that we are, and everything that we will come to be.” The group has just kicked off their tour with Dying Fetus and Thy Art Is Murder, yesterday. In case they weren’t cool enough, the group also share their love beer and video games in an interview from Metal Injection. Get Where Owls Know My Name now and listen to the title track below. Comprised of lead vocalist Brent Mills, Johnny Muench on bass, Nick Spencer on guitar and Ethan Spray on drum, Greyhaven merges hard rock guitar solos with group vocals and catchy choruses for a heavy thrash punk sound tide up with an explosive ribbon. Their new album Empty Black from Equal Vision Records captures their experimental feel, challenging what you thought you knew about rock and roll. Kill Your Stereo compared the Louisville troupe to hard rock favorites like Every Time I Die, Norma Jean and The Dillinger Escape Plan to Thrice and Deftones, proving the group are worthy of a listen and likely your next obsession. Take a listen to their eerie, contagious single “Ten Dogs — Red Heaven” and see how Greyhaven have made an “…accident look like it was on purpose.” Find the full album you crave Empty Black out now.